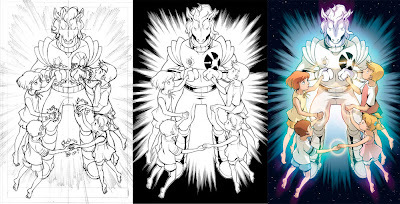 Gurihiru-Blog: Power Pack: Day One #2 On Sale ! thank you for posting the pencil and pen work, it's great to see the progress. 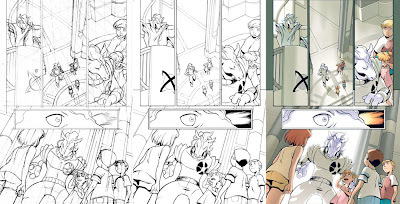 I am really impressed with the perspective lines- I don't have much experience with that. I got issue #2, it is awesome! Great job guys. 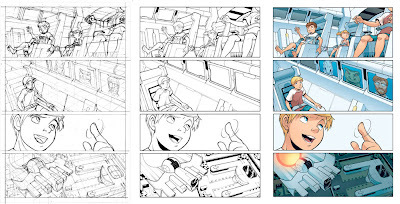 Thanks so much for the great work you both do on the Power Pack comics. Our daughters are huge fans, and both my husband and I always enjoy reading and re-reading the books to them, and we really miss your work when we have a different artist on the series. Gingashi- I was formerly troubled by perspective. David Chelsea`s PERSPECTIVE book was very useful for my study. It is famous, so great, my recommend. Ana- Thanks for the visits, and thank you for the kind words! 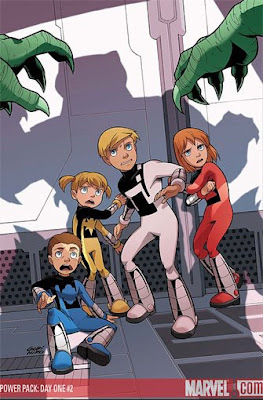 Power Pack is comics for kids. I`m very glad that your daughters read. I just finished issue #2 and really liked it. I especially liked Katie's fantasy with the "magic pony" it was SO cute. I also noticed that you are using more and more black areas such as heavy shadows. I like it and think it helps make the work more lively. Do you enjoy any American comics?